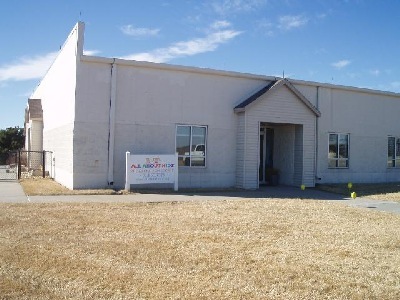 All About Kidz Preschool and Childcare was established in 2003. We have 6000 square feet of interior space. Our building was designed to be open, bright and inviting. We have 7 large classrooms that surround a huge multipurpose room. Our elevated stage with professional lighting is used for plays and other performances. Drinking fountains, sinks and bathrooms were designed for young children and are easily accessible. Our attached playground is one of the biggest in the area and boasts an outdoor natural classroom with garden center, music wall, basketball court and large riding track for scooters and trikes. We are located in the Walnut Grove shopping complex at 153rd and Q street. We would love to give you a tour of our outstanding facility! Please call or stop by anytime during business hours for a personalized tour. Since our beginning in 2003 All About Kidz Preschool and Childcare has been responsible for providing outstanding care for hundreds of families with children ages 6 weeks to 11 years. Take a tour anytime between 9am and 5pm. You can also call and set up a personalized visit that fits your schedule. Our new location is at 780 Pinnacle Drive in Papillion adjoining St. Martha's church. This area on 72nd street is home to many shops, stores and restaurants and is a perfect location for All About Kidz. See more about our new location and building in "Kidz Newz".